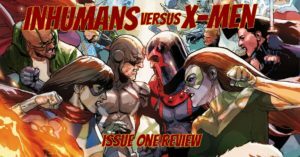 Writers, Charles Soule and Jeff Lemire, along with illustrators, Gerry Alaguilan and Lenil Yu, and colorist, David Curiel, brings us this first salvo in this world-shacking conflict between The X-Men and Inhumans. 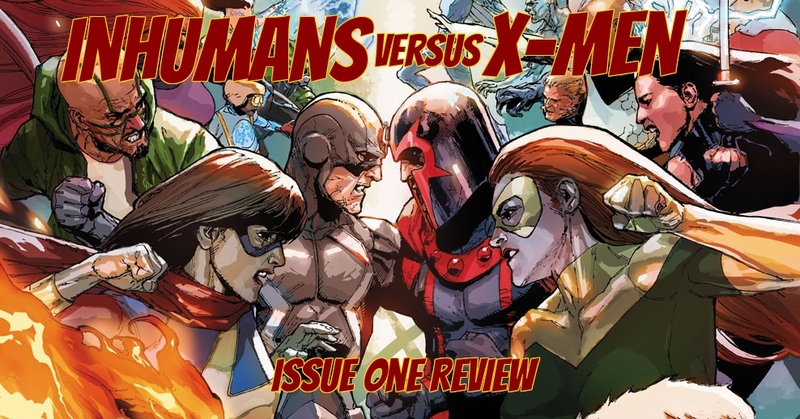 Tensions between the two groups have been percolating for a long while and it finally boils over in this issue where The X-Men mount a series of intricately orchestrated attacks on their Inhumans foes. The stakes are clear… For The Inhumans, the Terrigen Cloud is sacred and the means through which their people, culture, and way of life can be maintained. For The Mutants, however, the cloud is poisonous and deadly. For one group to prosper the other must die and all efforts to attain an alternate, mutually beneficial solution have been exhausted. The time for diplomacy and negotiation has ended and there is no longer any choice but to go to war and The X-Men are going to strike first.The issue begins with The Beast apprising his fellow X-Men of his failed efforts toward ascertaining a cure. The Beast has spent the last several months on New Attilan, desperately seeking a solution for Terrgen toxicity in Mutants; yet these efforts have proven futile. The Terrigen in the cloud is rapidly bonding with nitrogen molecules in the atmosphere. The plant will soon be uninhabitable for Mutant life. While The Beast has been the voice arguing for a peaceful resolution to this dilemma, his former colleague, Emma Frost, has been his foil… advocating for a full fledged attack. They need to finish what Cyclops had died starting, they need to destroy the second and final Terrigen Cloud. Beast disagrees; it’s not that he has compunction over eliminating this sacred element of Inhuman culture, but rather he feels the Inhuman forces will overrun them. He doesn’t believe the X-Men could defeat The Inhumans in battle and recommends instead that Mutants evacuate the planet. 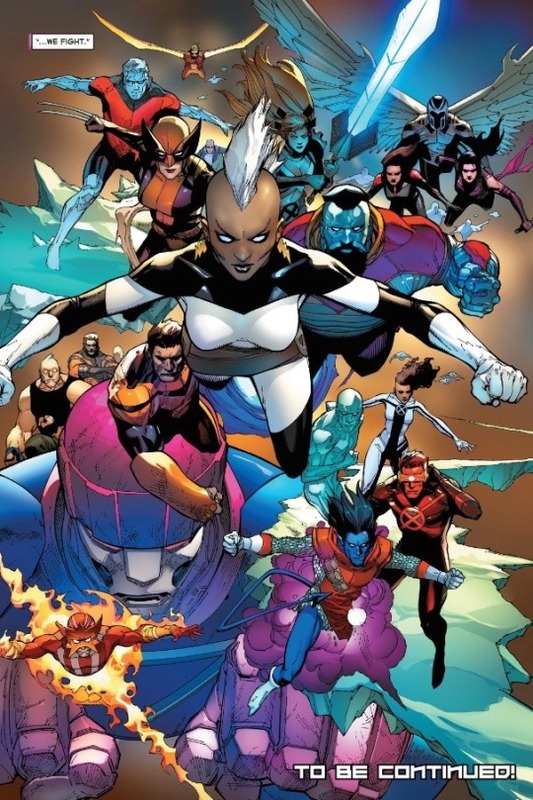 The leaders of the various X-factions are there and they put the matter to a vote: go to war against The Inhumans or leave earth in search of refuge among the stars. Beast and Forge both vote to leave; in a surprising out-of-character move, Rogue votes with them. The others, Magneto, Emma, the younger McCoy, and Storm vote to stay and fight. Outvoted, the Beast argues that their decision is folly; he feels they have no chance against The Inhumans. Yet Emma counters; while The Beast has been working diligently in his efforts to find a cure, The X-Men have been devising plans of their own. An intricate stratagem has been devised, a method for systematically taking out the Inhumans biggest hitters, leaving the rest vulnerable to a frontal assault. The Beast is upset that the others have gone behind his back. He attempts to leave, possibly to warn his Inhuman colleagues. In a shocking twist, Storm blasts Beast in the back with a lighting bolt. It turns out she has been a part of Emma’s plan all along; indeed she has been integral to its development. As The X-Men see it, The Inhumans’ greatest threats are Black Bolt, Karnak, The RIV, and Lockjaw. Remove these pieces from the game board and New Attilan will be left vulnerable. The first of these sneak attacks takes place in The Quiet Room, Black Bolt’s Manhattan social club. A rather thinly veiled Dazzler has infiltrated club posing as the lounge singer, ‘Lady Shine.’ Flagman informs Black Bolt that an important guest is awaiting him in his private meeting hall. This guest turns out to be none other than Emma Frost herself. She stalls Black Bolt long enough for Dazzler to arrive, who then pulls a gun on hum. As expected, BB utters a slight sound, firing his sonic powers at Dazzler. Dazzler’s mutant powers allow her to absorb sound and redirect it back in the form of lasers. Emma reverts to her crystalline form and karate chops Black Bolt in the neck. BB has traded punches with The Hulk so Emma’s blow barely hurts him. It does momentarily stun him, however, giving Dazzler the opportunity to blast him with the laser-based form of his own sonic powers. It fells the midnight king and just like that The Inhuman’s biggest heavy is taken out. Elsewhere, at The Tower of Wisdom, Jean Grey has come to visit Karnak. Fortunately for Jean, Karnak is still under the assumption that there is a truce between The inhumans and X-Men, so he opts not to just jam his two front fingers into her brainpan. Meanwhile, The Royal Inhuman Vessel (or RIV) has made its way to Chechnya just ahead of the Terrigen Cloud. Crystal’s team has identified a sole Mutant among the dilapidated buildings of the waitron city. Gorgon is sent in to evacuate this Mutant before the Cloud makes landfall. This mutant, covered in a hood and blanket is discovered by Gorgon and brought aboard the RIV. There the Mutant reveals himself as Magneto. 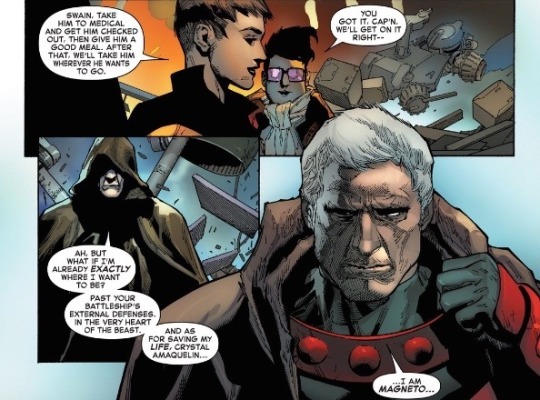 Being brought inside the RIV in this fashion has allowed him to traverse the vessel’s external defenses and Magneto uses his magnetic powers to rip the vessel apart, snaring the various Inhumans in twisted tentacles of reformed metal. Back on New Attilan, Queen Medusa has been speaking with three Inhuman youths all preparing to go through the process of Terrigenesis. The trio will be flown up into the atmosphere and through the Terrigen Cloud, thus triggering their transformation. Although these youngsters are putting on brave faces, it is clear that they are apprehensive over how and in what ways they will be changed. Medusa empathizes with them; she too was anxious prior to her own Terrigenesis. She reiterates what her mother had told her before she went through the change… stating that Terrigenesis doesn’t truly change you, it just brings to the surface who you truly are. The ceremony is interrupted as they are altered to The X-Men’s attacks on The RIV, The Tower of Wisdom and The Quiet Room. The children and non-combatants are all ushered to safe-rooms in the bowls of the castle. Medusa had expected that this attack would come. Johnny Storm is there with her and she offers him the opportunity to leave. The Mutants are not Johnny’s enemies, this is not his fight and he should feel no obligation to remain. Johnny declines; he’s willing to fight at Medusa’s side. The issue ends with an armada of X-men bearing down on New Attilan… things are certainly not looking good for the Inhumans. The X-Men are longtime favorites of mine; yet all things considered I prefer The Inhumans… and it’s rather painful to see them routed in this fashion. This pain, however, is mitigated by just how well the narrative unfolds. 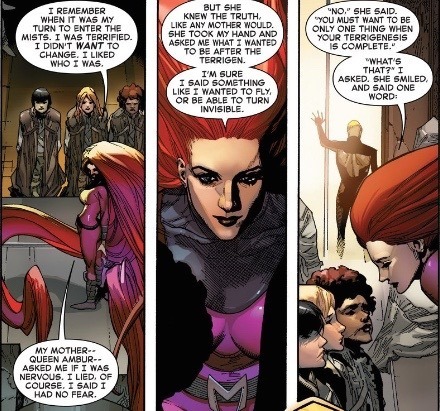 The various attacks on the Inhumans key players unfold gradually, interspersed with what turns out to be flashbacks of The X-Men debating on whether or not to go to war. It reminds me of that wonderful, dreadful scene from F.F. Coppola’s ‘The Godfather’ where Michael Calderon’s child is being baptized and the narrative continuously switches to scenes where each of his adversaries are systematically assassinated by his goons. The Inhumans may be quite powerful, but the X-Men have them outmatched in the crafty/treacherous department. Round one goes to team X.
I was not a particular fan of how Death of X went down; it was a clunky story that relied on a twist ending over a satisfying revelation. And I’m happy to report that Soule and Lemire do a significantly better job of writing the two teams in this issue. The character’s voices are on point and the narrative unfolds in a neat, cinematic fashion. The X-Men’s sneak attacks are quite ingenious and well thought out. Emma’s recruiting Dazzler is an especially clever move. The Dazzler and Black Bolt have shared the page a couple times before (way back during Daz’s solo series), and it is indeed cannon that she can take in and absorb his sonic powers. Furthermore, Emma is smart to take on BB in the heart of Manhattan, where he would be unwilling to really open up with his powers (in that doing so would destroy much of the tristate area). Although I do hope that Soule and Lemire will eventually remember that BB has other powers beside his sonic abilities. This is the third time that Backgarr has been nerffed at the very beginning of a fight and I got to say it’s getting rather old. Magneto’s taking out the RIV is equally cunning, exploiting Crystal’s team’s humanitarian efforts to traverse the vessels’ defenses. Seeing the RIV ripped apart by Magneto’s powers, however, left my quite worried over the fate of poor Hub (the Inhuman dynamo is powers the craft). Has Magneto inadvertently killed Hub? Not only that, but there are plenty of children and families living on The RIV. What has become of them? Hopefully time will tell. Jean’s trap for Karnak was a little less adroit. I’m not completely familiar with the full extent of teen Jean’s telepathic powers and I have to imagine Karnak would be able to see through her psychic illusions with little difficulty. 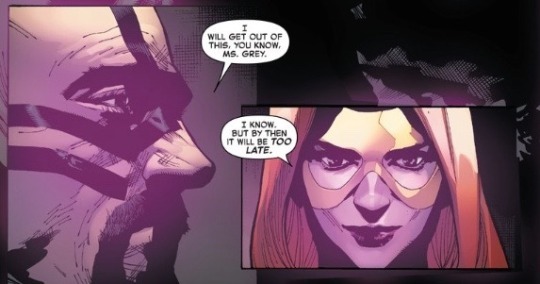 Though to be fair, it seems as though Jean and Karnak’s encounter is set to be more fully addressed in an upcoming IvX tie-in issue of Uncanny X-Men so it’s understandable that Soule and Lemire might chose to leave the matter less explored. As for Lockjaw, he looks like he weighs more than a ton and I’m not sure a single bottle of Klonopin is going to be quite enough the send him to the land of nod. I wonder if Kamala’s brief appearance in the book is a foreshadowing of her coming to Lockjaw’s rescue. The art is beautifully done throughout. Gerry Alaguilan and Lenil Yu work wonderfully together and the color pallet chosen by David Curiel fits the theme perfectly. Storm, Magneto, and Medusa are especially well rendered in the art. 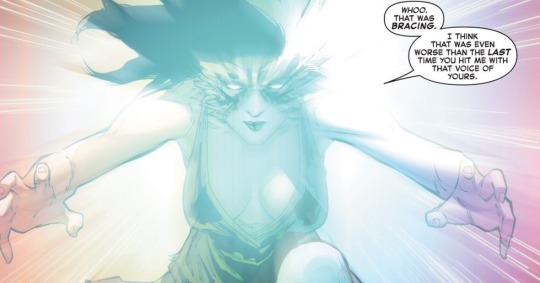 Likewise Emma Frost, whose soft, angelic features contort into a gruesome sneer whenever her vitriol toward the Inhumans comes to the surface. Some quick notes: Medusa’s mother, Ambur, was never queen. Rhynda was queen and Ambur was a duchess, by way of Medusa’s marriage to Black Bolt. Also, never give a dog Klonopin (even if it’s a giant Inhuman dog); there are some benzodiazepines cleared for animal usage, but dosages designed for humans can be fatal to animals. Once again, it is quite harsh seeing my beloved Inhumans so routed by the X-Men in this issue. yet it was executed beautifully and I know this is just round one. If the rest of IvX follows suit in regards to such high quality of art and writing then we are in for a fun ride and an excellent event.